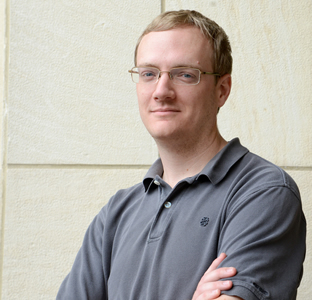 (June 30, 2014) -- Researchers at UTSA are discovering that the current protective eyewear used by our U.S. armed forces might not be adequate to protect soldiers exposed to explosive blasts. According to a recent study, ocular injuries now account for 13 percent of all battlefield injuries and are the fourth most common military deployment-related injury. With the support of the U.S. Department of Defense, UTSA biomedical engineering assistant professor Matthew Reilly, distinguished senior lecture in geological sciences Walter Gray and biomedical engineering adjunct professor William E. Sponsel, M.D. have been collaborating with researchers at the U.S. Army Institute of Surgical Research at Joint Base San Antonio Fort Sam Houston and the UT Health Science Center at San Antonio to understand the unseen effects that can occur as a result of a blast injury. In a basement laboratory at Fort Sam Houston military base, the research team has spent the last two years simulating Improvised Explosive Device (IED) blasts on postmortem pig eyes using a high-powered shock tube. So far, they have discovered that the shock wave alone created by an IED, even in the absence of shrapnel or other particles, can cause significant damage to the eyes that could lead to partial or total blindness. Perhaps the most striking discovery is that these blasts can damage the optic nerve, which transmits information from the eye to the brain. Optic nerve injuries occur even at low pressures and could be the cause of many visual deficits, which until now have been associated traumatic brain injuries. "There has been considerable controversy surrounding whether primary blasts could damage the eye," shared Reilly. "No one had shown conclusive evidence before, perhaps because they weren't looking at the problem quite as closely as we have. We had some idea of what to look for based on results from computational models and now we have experimental data that supports this phenomenon." 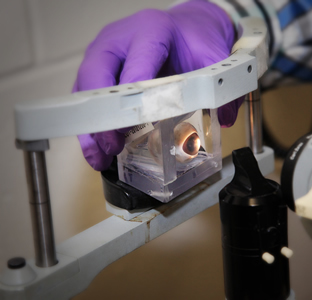 This groundbreaking research will not only help physicians know what type of injuries to screen for and treat following a blast injury, but also create a reliable model to test various protective eyewear solutions that might prevent or reduce blast damage to the eyes. Reilly has several family and friends who currently or previously serve in the military who have had various injuries. "I wasn't in the military but I would like those who serve our country to be better protected in the field or give them better diagnostics when they are injured," he said. "I want to make sure their quality of life is as high as possible after they have been deployed. I am just trying to give back." Moving forward, the research team plans to delve further into the link between the optic nerve and the brain in an effort to understand the causes and symptoms of traumatic brain injuries. Learn more about the UTSA College of Engineering at engineering.utsa.edu. Connect online with UTSA on Twitter, Facebook, YouTube and Instagram.